Is Your Child Struggling to Find a Place in The Fitness Universe? - Energetic Juniors - Contact Us! Is Your Child Struggling to Find a Place in The Fitness Universe? DO YOU FEEL LIKE YOUR CHILD IS STRUGGLING TO FIND A PLACE IN THE FITNESS UNIVERSE? Maybe they aren’t the top player on the team. Or maybe they’re just not that interested in organized sports. That doesn’t mean they aren’t competitive. They might be more of an individual medalist type of athlete, Olympics fans, anyone?! Individual sport athletes typically have a greater freedom in the methods they can take to accomplish their goals. It can be more creative, if you will, as opposed to getting an entire team on the same wavelength. Now, there are limitless personal challenges your kids can come up with that will not only help them become more physically active but goal oriented as well. When creating a goal dream big! Often times, especially as we get older, we begin to think we’ll never accomplish something because we’ve convinced ourselves it’s out of reach. But you’ll never really know unless you try, which is the lesson that should be shared with kids. As a coach I want to teach my athletes to pursue their dream. I ask them to come up with one or more goals they would like to accomplish. I discourage them from limiting themselves even if it sounds “impossible.” Even the smallest goal should be respected because after their experience the feeling of conquering the goal they’ll be hooked! How to accomplish the “impossible” goal. Ask them how they think they can begin to conquer these goals. There needs to be a plan with smaller steps in place. Breaking down the steps into smaller goals will create the vision. When they can see the vision it will encourage them to continue on. You’ll be able to watch them grow and build strength, confidence and a work ethic that will carry through to other parts of their lives. In the beginning when asking kids to come up with a challenge they’d like to take on you might get a lot of “I don’t knows,” “I don’t care,” “whatever,” or even just a good old fashion shoulder shrug, especially if they haven’t found their love of sports or fitness yet. Try to maintain your optimism and begin by inviting them into your challenges. They might not know where to begin and will need to watch you as their role model figure out your way through it first. 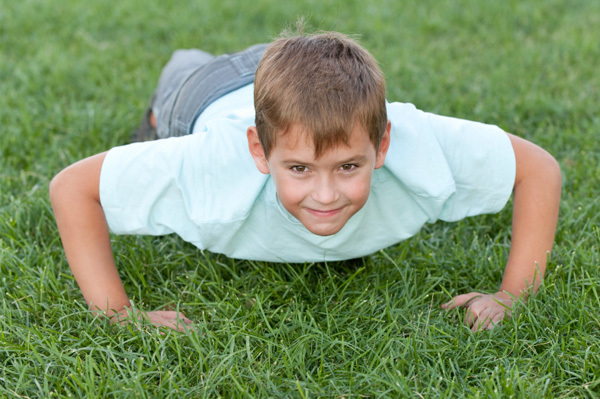 If you pick something like push ups, which has no equipment necessary, have them help you figure out the steps to complete a challenge. What is the goal, first of all? Maybe it’s to do 10, 30 or 50 push ups at once? Make a vision and break it down into smaller wins to crush! Figure out how many you can currently do and move onto picking a feasible escalation and time frame to complete the challenge. Of course you’ll want to celebrate together once you’ve crushed that goal. But as soon as you have use that momentum, use it to move onto the next challenge. Try ones that are out of your comfort zone like learning to rock climb, learning a dance, getting 10,000 steps in a day etc. After the first challenge have them begin to drum up the ideas and plan for execution. Let them know the path wasn’t easy. Let them know you struggled but most importantly let them know you continued on. So when it’s their turn they will emulate your perseverance. After a while they may want to do this on their own and while I encourage that please be sure all safety measures are being addressed.